Repairing A Dripping Tap. 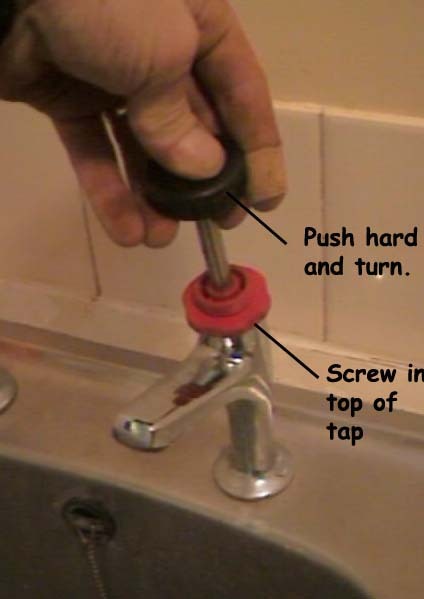 How to fix a dripping tap including how to change a tap washer or tap seals and reseating a tap. 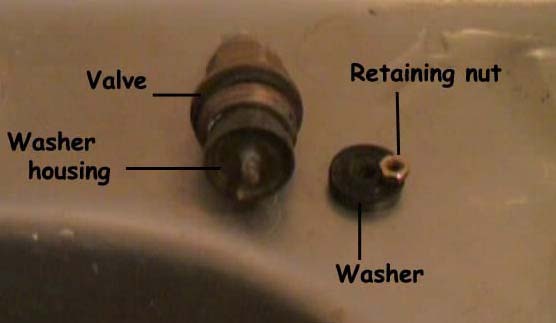 Descriptions, explanation and parts diagrams on how to change tap washers, and the different types of washers and taps. This project also includes information on how to grind down valve seats and how to open a tap valve when it is jammed or stuck. Here is a secret! 99% of the time a dripping tap has nothing to do with the washer which, because is it rubber, is as good as the day it was installed. 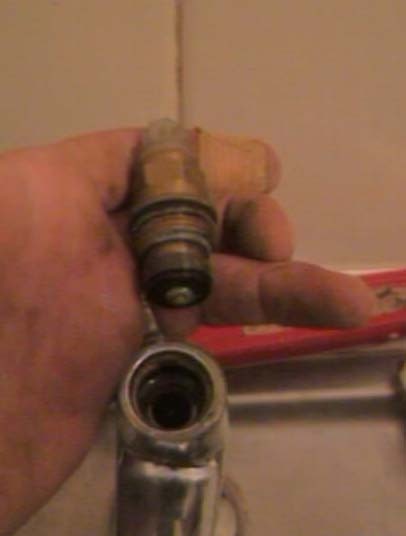 The problem is normally the valve seat which the washer sits on when the tap is closed. The pressure of the water tries to force it under the washer and little by little it erodes the brass from which the seat is cast. Tiny little canals are formed in the seat which allows water to pass under the washer and out through the tap. This is very often caused by hard water and can quite often be eliminated in the future by visiting www.eddy.uk.com. 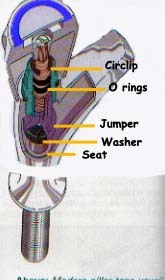 We have detailed below the full procedure for changing a washer and re-grinding the seat. First, turn off the water and, if it an upstairs tap, open one of the taps downstairs to drain the pipes: The principle of "tap operation" is the same with most taps and the diagram below can be referred to for the names of various parts. Most modern taps have the hot (red) and cold (blue) indicators on the top. These usually hide the screw which holds the handle on. The handle also acts as a cover for the valve. Before you start to dismantle the tap, place the plug in the hole. This will stop you losing anything down the waste. On most tap indicator covers, if you look closely around the edge you will see a little recess. Using a flat edge screwdriver insert the flat edge into the recess and wiggle it under the cover and prise it up. In some instances there won’t be a recess so you will just have to use a very small screwdriver and gently slide it under the indicator cover to prise it off, being careful not to damage it. 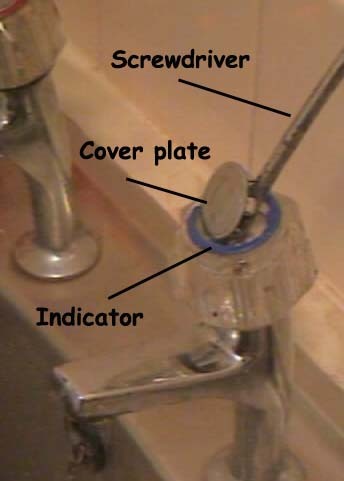 To remove the tap head, simply prise off the tap indicator cover and remove the retaining screw beneath it. Once the screw is removed the tap head should then pull off. Occasionally, once the retaining screw has been removed the head of the tap will still not come off. 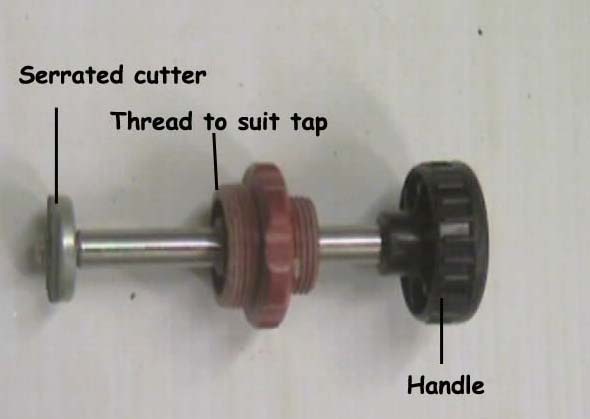 Over time the head of the tap can stick on the tap spindle and become jammed. 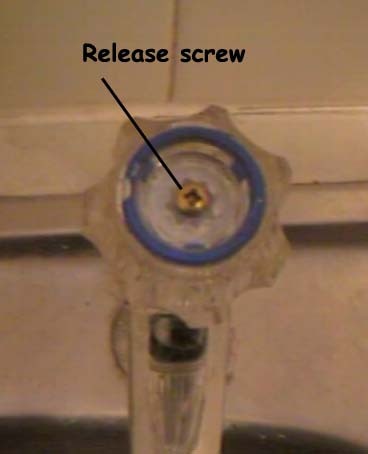 In this instance it’s always a good idea to firstly get some WD40 or other easing fluid and spray down into the area where the screw fixes in and also into any other areas around the tap handle/cover and also up under the bottom edge of the cover if possible. Leave for ten minutes or so to allow the fluid to penetrate and try to remove the head of the tap again. If you are still unable to get it off try applying more easing fluid. The last result if after trying the easing fluid option is to lever the tap head off. As you might guess this can be quite tricky to do and the potential for damaging items is high so proceed with care and caution. 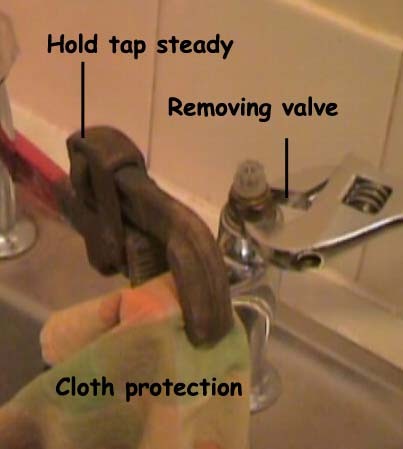 Using a large open-ended spanner (or similar), wrap a tea towel or cloth around the largest open end (to prevent damaging the tap or tap head). Now find or cut a block of wood or similar sturdy object to the height of the base of the tap head from where the block of wood will be resting on the worktop or edge of the sink and wrap this in a tea towel or cloth. Position the open end of the spanner underneath the tap head and the block of wood under the shaft of the spanner (keeping it as close to the tap as possible). Now push gently down on the other end of the spanner, pushing the tap head up. Keep the spanner as close to the main body of the tap as possible so the force you are using is as vertical. As said, be very careful when doing this and also ensure that wherever force is being applied you have added additional support to compensate. 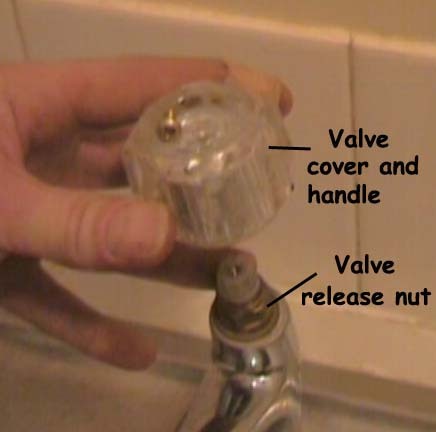 The next step is to release the valve, but first make sure the tap is wedged firmly in position (if it moves while undoing a tight valve nut, it may loosen the water connection underneath) and place a cloth over the tap to avoid scratching the metal. There are two methods for doing this – one is the traditional method and is shown here below and the second method is achieved by using the Easy TapSplitter Tool kit – more information on this tool and how it is used can be found in our product review. The operation of the tap handle, opens or closes the washer against the seat, which is a small shelf just inside the body of the tap. 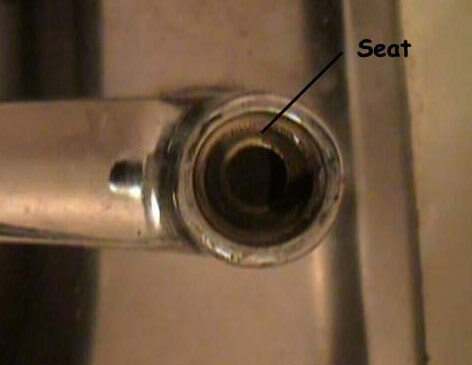 If your tap has been dripping, more often than not, small canals will have been eroded into the metal of the seat. These can be removed by grinding the rest of the seat down to level of these canals. This will produce a flat, smooth seat for the washer to sit on and seal the flow of water. The seat grinder is a simple machine, available from our tools section at the base of this page. 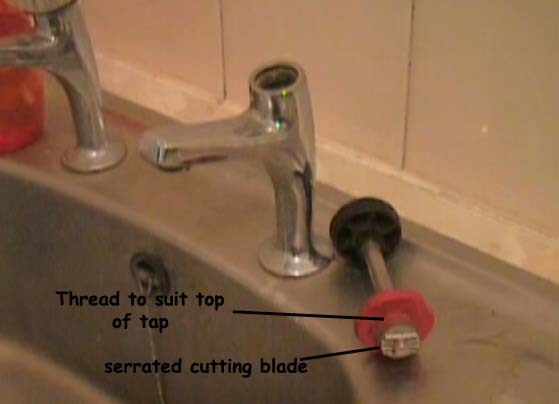 The correct size serrated cutter for your tap will be the one that just fits through the opening, and the correct size thread is needed to tighten up in the threads which held the valve. Insert the grinder, tighten up and push down on the handle twisting as you do. Some plumbers prefer to make a full revolution with the grinder, others prefer to twist back and forth to grind the seat down. Always finish with a few, full revolutions to get the seat as smooth as possible. Remove the grinder periodically and run your finger around the top of the seat, you will feel any remaining indents. Keep grinding until it is smooth and replace the valve etc. Turn on the water. (Don’t forget you may have a tap open downstairs). 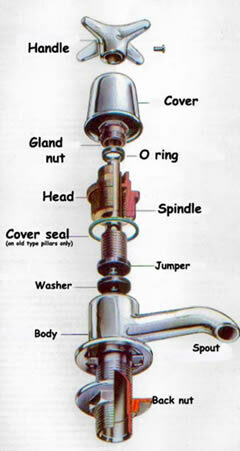 A dribble from the top of the tap is usually a result of the Gland seals being worn. Sometimes there is a gland nut, which can be undone to reveal the O ring sealing the gland to the head. (see diagram at top). Other times there is a circlip holding the spindle to the head. This can be removed carefully as shown below. In both instances an O ring seal or seals will be revealed and these can be changed by rolling them from the spindle and fitting new.